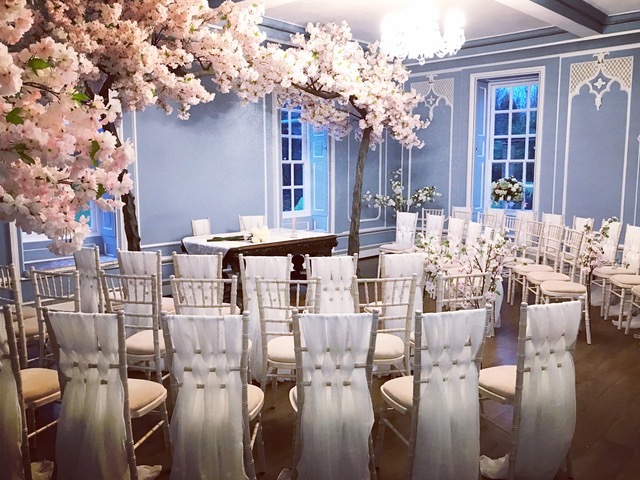 We are a small family run business, based in Chelmsford, who pride ourselves in specialising in all manor of chair decor to suit your theme or style. We have a wide range of bespoke Chair Covers and Chair Decorations for weddings, events & corporate functions in the Essex, Hertfordshire, Suffolk & surrounding areas along with Candy Buffets, Candy Carts, Aisle Runners, Wedding Post Boxes, Bay Trees, Sequin Linen, Flower Wall, Ferrero Rocher Stand and other venue decor. We offer a personal service and have over 60 different coloured sashes in organza, satin and taffeta to choose from. We are confident that for whichever theme you are looking for we will have something that will add some extra sparkle to your big day! If you are here to look at at our other items and feel that chair covers are not for you, please see if we can convince you with our Venue Gallery of our favorite places to decorate. Please take your time to explore our website and also please take a look at our Facebook and Twitter pages for more updates of our work. If you would like more information or would like a consultation for your wedding or event, please Contact Us. We understand that every detail matters when it comes to planning an event so if you have something particular in mind please let us know. Please take a look at our new Ferrero Rocher Stand! PLEASE LOOK AT OUR NEW MAGIC MIRROR!! Our Flower Wall will make a beautiful backdrop to your all important photos.